JUBA, South Sudan, Apr 8 2016 (IPS) - Facing an unprecedented economic crisis, South Sudan — the newest nation of the world — has urged its 12 million inhabitants to turn to agriculture instead of depending on declining oil revenues. Before the fall of oil prices below $30 a barrel in the international market, oil-rich South Sudan used to import virtually all of its basic requirements from overseas. Chicken came from Brazil. Tomatoes, onions, maize flour, cooking oil, dairy products and beans are still being imported from neighbouring Uganda. China and Dubai export a variety of goods such as soft drinks, smart phones as well as construction materials. All of this is unsustainable and worries the government. South Sudan has ignored agriculture since it achieved its independence in July 2011. Up to 75 per cent of the country’s land area is suitable for farming. “South Sudan has virgin land. Yet we import most of our food from neighbouring countries,” finance minister, David Deng Athorbei, complained during a meeting organised in the national capital Juba recently to address the deteriorating economic situation in the country. Every year, South Sudan spends between US$200-300 million on food imports, according to estimates for 2013 provided by the Abidjan-based African Development Bank (AFDB). “South Sudan currently imports as much as 50 per cent of its needs, including 40 per cent of its cereals from neighbouring countries, particularly Kenya, Uganda and Ethiopia”, according to AFDB. During the first two years of independence, the country was producing nearly 245,000 barrels of crude oil per day, raking in billions of dollars in revenue annually. As a result, the elite saw no value in labour-intensive activity like farming. That is now changing. A drop in the oil output, a decline in global oil prices and the devastating conflict in South Sudan, as well as an acute scarcity of hard currency have triggered shortages of goods in the market. South Sudan, which currently produces 165,000 barrel of crude oil per day, depends on oil revenue for nearly 98 per cent of the total government budget. “We must diversify. We should not depend on one commodity — oil. We have gold in Kapoeta (on the border with Kenya). We have cattle,” said Gabriel Alak, a senior official of the ruling Sudan People’s Liberation Movement (SPLM) on a popular programme, Face the Nation, on the state-owned South Sudan Television recently. 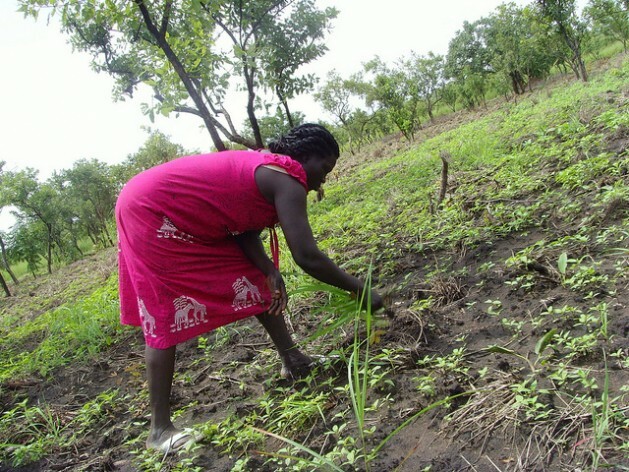 Campaigners are now focusing on food production to mitigate the impact of a devastating conflict that erupted in Juba in December 2013. The violence spread quickly to oil-producing states of Jonglei, Unity and Upper Nile. The fighting has left hundreds of thousands of people in need of humanitarian assistance. At the height of the oil boom, South Sudanese businesspeople had directed their energy toward trade, ignoring agriculture. “The business of trade is over. We now need to embark on the business of production. We have to change our ways of doing business. Let’s start with agriculture,” Athorbei advised. In April 2015, President Salva Kiir donated 1,000 tractors to farmers around the country. He also set up the country’s first food security council headed by himself. “I am determined to end hunger and malnutrition in the Republic of South Sudan,” Kiir said during the launch of the tractors in Juba. “We have vast fertile lands, abundant water and climate suitable for production of wide variety of food and cash crops but the country still faces enormous challenges which prevent it from realising its full potential,” he said. “Experts estimate that up to 300,000 metric tonnes of fish could be harvested on a sustainable basis from its share at the River Nile swamps and tributaries,” Kiir disclosed. South Sudan produces some food crops, but the food is rotting in the bush due to poor road network to transport the commodities to the market. Athorbei said he would set aside some money in the financial year 2015/2016 to boost agriculture. He did not say how much he would allocate. With South Sudan joining the East African Community (EAC) on 2 March 2016, Juba hopes to invite farmers across the region to till the country’s vast lands. “This will cut transport costs and reduce food prices,” vice-president James Wani Igga told a parliamentary caucus of the ruling SPLM in Juba on March 10, 2016. EAC comprises Kenya, Uganda, Tanzania, Rwanda, Burundi and now South Sudan, with a combined population of more than 157 million. As South Sudan works out plan to fix agriculture, prices have continued to spiral beyond the reach of the poor. The crisis has prompted parliament to urge government to reduce inflation to mitigate the sufferings of ordinary persons. “There is urgent need to mobilise up to US $20 million for the importation of food commodities and medicines within a period of one month. The food commodities shall be sold through established consumer cooperative network,” the chairperson for the committee for economy, development and finance in parliament, Goc Makuach Mayol, said in a 14-page report on March 7, 2016. The parliament has also called for a probe into a US$70 million, which was disbursed by an agency known as “financial auction” to commercial banks and forex bureaux with instructions by the central bank to allocate 50 per cent for importing food commodities, 30 per cent for industrial inputs and 20 per cent for school fees and medical treatment overseas. The parliament did not indicate when the money was disbursed. But it has demanded for a record showing how the money was spent.